So here is another goodie from a while ago since I don't have anything new to share! Thanks to Darling Darleen for sharing this easy, free, personalized happy birthday banner that I've used twice already (btw you must check out her friggin sweet monster truck costumes she made for the party out of cardboard boxes). I had the first banner saved on my computer so the second time around I simply changed the font color, child's name and added "1st". I also tied on some leftover tulle that you can barely see in the pic. Here is my original document in case you don't want to bother choosing fonts and colors. Enjoy! My boy loves to put gloves, mittens, his sister's leg warmers and everybody's socks on his hands and arms yet it never occurred to me to make him arm warmers until I saw this post by I Am Momma - Hear Me Roar. So I bought a 3-pack of men's knee-high socks at Target for $5 and got to work. They just look like a long-sleeved shirt underneath a t-shirt Sorry about the terrible lighting but you get the idea! Here's a fun one for ya! Check out Incredible Edible Crafts for the simple how-to. This cost me about $10 for all the fruit and the cookie cutters. I'll definately be making more in the future!! Cute huh?! I made this last year for my then 2-year-old to use for trick-or-treating but didn't bother to check the finished size before starting because I was too excited. It's really, really small so if you're going to use it as a Halloween basket you should probably make it bigger. I added the "BOO" by carefully cutting letters from my leathery fabric then stitching a different printed fabric behind each letter right around the letter's edge. I altered the handle as well using corset boning so it would stay out of the way and so that my little guy could easily hold it. Here is the link to Pink Penguin's tutorial which is not a Halloween basket - hers is super duper cute, you have got to see it. This is where I learned to box corners! I think I need to make another one more like hers to throw all my strings in as I sew. Enjoy! I know I've really been MIA lately, sorry. So once again I've found a project that I made a long time ago that I will now share with you since I haven't had time to make anything new lately! These kitten ears are just triangles but you can add round ears, long ears whatever. I just decided where I wanted the ears and attached pink yarn at the right-most side of the first ear then crocheted a few rows decreasing as I moved up. I then crocheted around the edge of the ear with black and voila. I added a tulle bow for a little extra something. You know those frigging awesome catch all bibs from Walmart that cost $5 and are only "wipeable" on one side? Well they're my favorite except the fact that I have to replace them constantly since you can't wash them (only wipe) and the back gets gross so fast. SOOOO I decided to make my own with both sides being wipeable and boy oh boy I love them so much! All I did was use my old bib as a pattern. For my daughter's I had to cut 2 pieces (each a little bigger than the bib for seam allowance) and sew them right sides together leaving an opening at the bottom to turn then topstitch all the way around. If you want more details on sewing this see my other bib tutorial here, it's the same idea minus the batting. For my son's I only had to trace and cut one piece. Once the bib is made you add snaps (I like the hammer on kind) in the same place as the Walmart bib's snaps (except I excluded a couple that I felt were not necessary) and you're done. They're so easy to clean and the only *true* catch-all bib, in my opinion, because the bottom actually sticks out instead of lying flat, because of the snap placement and shape of the bib. I think I'll be adding these to my Etsy shop since I think everyone should have one! Do you ever look at something you have owned for a while and go, "What the crap"? So I got some fabric and found my husband's staple gun. I know it's been done before. By everyone and their dog. But I finally did it myself and took some pics to help explain how to do the corners. Hopefully it's helpful to someone out there! You can use a canvas like I did or make your own frame. Staple it all around the back except on the corners. Just leave those alone for now. Then fold fabric so the back corner of the canvas is mitered leaving the rest loose. Then you take what was left and pull it taught, placing another staple on the back of the canvas. Repeat with each corner then add the hangy thingy and you're done. This is a great little project that I plan to do again one day. 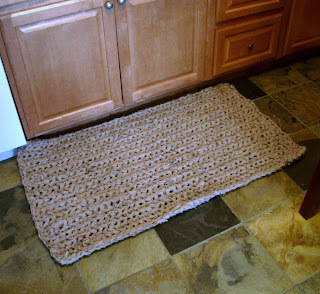 It's a rag rug that I made using a big ol' crochet hook and some strips of fabric. You just cut long strips out of whatever fabric you want and connect them together by cutting a slit in each end so you can make a slipknot. Treat it like yarn and crochet whatever shape rug you want with the fattest hook you can find. I just made a chain and crocheted row after row of single crochet stitches til it was the size I wanted. I then worked around the edges to give it a finished look. My hands KILLED as I did this... I think it was because my fabric was heavier AND I cut my strips too wide for the hook I had. Do what feels good to you. It shouldn't hurt your hands like it did for me :) I'd love to see yours!